The weather was kind, misty but dry, with a chilly breeze into faces as runners headed out on each lap. 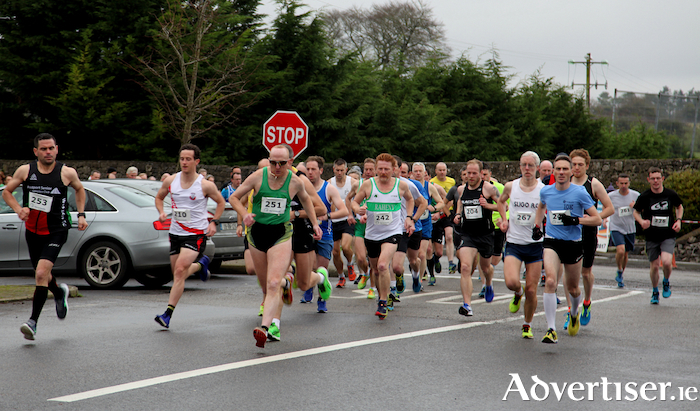 The event was the final race in Mayo AC 2017 Vodafone C&C Cellular Club League with women and men members competing for points and prizes. There was a busload of competitors from the Liverpool area - a long standing tradition. This year’s 10k winner was Stephen Donnelly (Ballina ) in 34:43. He was side by side with Shaun McLaughlin (Westport AC ) as they went out on the last lap where he pulled away and had 30 seconds to spare at the finish. Stephen is only the second Mayo man to win the race in its 52 year history. Ultan McNasser (Sligo AC ) was third in 35:48 - another consistent even paced performance Martin Ruane M50 and Owen Mongan M60 won the category prizes. Mayo AC won the men's team - Anto Devaney, Paddy Walsh, Padraic McVann and James Malone. Ellie Hartnett (UCD AC ) led the women's 6k from start to finish with a smooth and stylish display of running. She broke Catherina McKiernan's 2015 course record by 16 seconds finishing in 21:25. Heather Foley (Sligo ) ran strongly in second place 22:25, with Orla Tuohy - a local visitor from Southampton - third in 22:43. Kathy Gleeson tried valiantly to catch Orla but settled for fourth and first o40 in 22:48. The other category winners were Michelle Murphy F50 (Westport AC ) and Geraldine Heneghan F60 (Mayo AC ). Mayo AC team led by Colette Tuohy fifth in 23:09 (after her great run in Derry yesterday ) Ann Marie Clarke eighth and Angela McVann tenth combined to win the team prize.